So I honestly made this recipe so I could showcase one of the most amazing People I know. I mean I know a lot of amazing people thanks to having this website and being in the Paleo community, but one stands out above the rest and she needs to be recognized. Her name is Mee and she is the genius behind Mee Nut Butter (which if you haven't noticed is the basis of this recipe). And before you moan and complain that these are by far the most expensive brownies you will ever make, understand MeeNut Butter is like Paleo Crack, and the price is well worth it. But none the less, you can always substitute almond butter. But back to Mee, I had the pleasure of meeting her last year at a competition and I have loved her since. Her bubbly personality and smile that is double the size of her compact frame lights up everybody's day. She is such a giving and caring person, I kinda wish I could kidnap her and keep her to myself. But I know that isn't fair, so I will share her with all of you. She is the creator, maker, packager, shipper, and customer service department all in one for her product, and works harder than most I know. I just want her effort to be recognized and appreciated, so when you guys order your Mee Nut Butter HERE, know that an overwhelming amount of Mee's personal love and dedication goes into every jar you get. All those links go to her product and you can go love her on Facebook and Twitter too. Love you Mee!!!!!!! In case you missed it, Abel James from Fat Burning Man interviewed me on his podcast last week and also had me contribute 9 recipes to his amazing Free Paleo Ebook. You can find them both HERE. 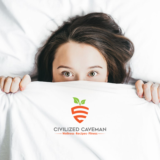 And as always don't forget to follow me on Pinterest, Facebook, or Twitter or support me by picking up your very own Civilized Caveman TShirt, Tank Top, or Hoodie. Just started Paleo…for gut health..just made this brownies but I left out the chocolate and banana and added applesauce and dry coconut flakes. But everything else the same…Wow these are delicious!! Can’t wait to try them with the cocoa!! Thanks for the recipes and your service!! God Bless!! Hi Lauri! Thanks for your input on the recipe! This is Non from Team Caveman :D It is pretty delicious, huh? Happy noshing! Had to get these in the oven quickly before I ate all the batter with a spoon! They’re still in the oven but I’m concerned how sticky and thick the batter is. Used an 8×8 dish instead of the 9×13. I hope they still turn out…. Just discovered your blog this afternoon and these look awesome!! Not to mention just about everything else I’ve seen on your blog thus far. =] Thank you for providing this deliciousness! Would this recipe work with frozen blueberries? The. Best. Brownies. I have. EVER. Made.! I’ve been trying for about a year now to make my own brownies, and have them be comparable to the box brands(aside from the nasty chemicals..). They would always turn out more ‘cake-like’, which I DON’T like in a brownie. This totally satisfies it! I just can’t believe that there is NO flour at all in this! Thank you! Meenut butter sounds really cool – thanks for introducing it to me! This looks great & I can’t wait to try it. After you’ve gotten some sleep you might want to reread the instructions & ingredients because they don’t match. Not a criticism, just thought it would be easier to follow after you fix it. You know I loove what you are doing on this blog since I’m on it all the time. Keep up the great work cause we love your recipes at my house. These look so good! I pinned them. Mmmmmmmm….. I think I just drooled on myself. We are both blessed cause I love you. And yes that would be awesome if we were neighbors, then I could help you. Cannot wait to make these brownies. I met Mee last week and bought 2 of her large pumpkin spice MeeNut. Delicious. I put the MeeNut on everything. MeeNut is amazing. Thank you!